In welcoming you this afternoon to the launch of the third printed edition of the Galway Review, I am aware that Ndrek and Uinseann are mentally pacing anxiously up and down like expectant first-time fathers outside a labour ward. Indeed my analogy is sound as we are here this afternoon to celebrate the birth of a book. And, as with any birth it had its pains and labours, but what might be termed a “bouncing” product has been born and it was created out of a creative urge or many contributors, some of whom you will be hearing over the coming minutes. The Galway Review, since its digital birth, in November 2012 has been amassing a global following and has now reached a readership close on 158,000 worldwide, particularly in the English speaking world. 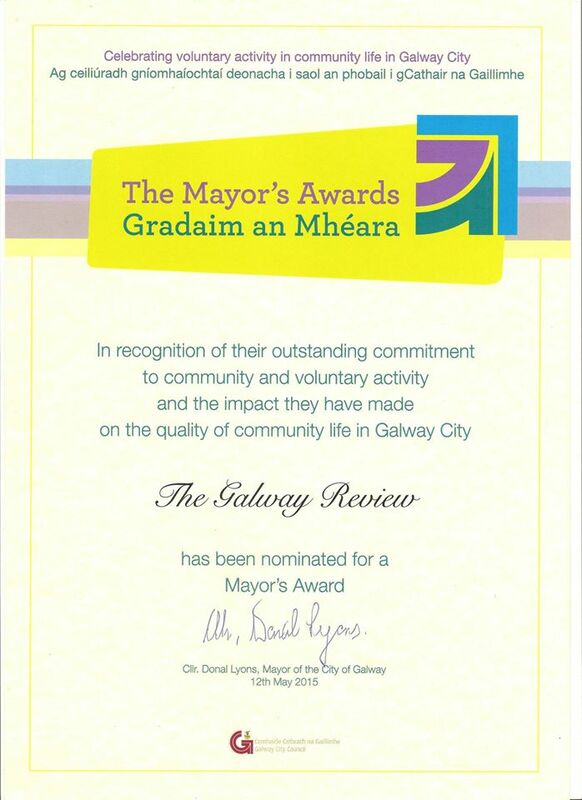 That is no mean achievement in such a relatively short space of time and when you consider that the team at the Galway Review carry out their work voluntarily and often at their own expense, it is an achievement that should be applauded and supported. I am delighted to be at the launch of this book as part of the Cúirt Festival festivities, because it is the joint efforts of organizers such as Cúirt and the Galway Review that enhance Galway’s reputation and place on a literary world map. I would go as far as to say Writers’ Week in Listowel – watch out! – Galway will soon claim the literary laurels, if it has not done so already! Behind every great expectant father there is a greater woman and the Galway Review is no exception in this regard. Máire Holmes, currently a writer in residence with Kerry County Council has been at the helm as Editor in Chief of the Galway Review since its inception. She too is a serial producer of books that over the years has given voice to literary communities in an Ghaeltacht, and the county and city of Galway. I would like to extend my special good wishes to her on her literary journey in Kerry. At a time when immigrant issues are to the fore it is very encouraging that the team at the Galway Review comprise, not only its Irish contributors and editorial team but also contributions from the international literary stage. Laney Lenox, an American, from Shreveport Louisiana, a young writer, has recently joined the Galway Review and of course Ndrek Gjini, of Albania, who initiated the project, continues to be its managing edtior. His know-how as a former journalist and teacher, and especially his computer skills, has created the dynamic that brings us a fresh and vibrant internet Galway Review on a weekly basis. I stated previously this is the 3rd printed edition of the Galway Review and on a personal note I was delighted to be a contributor to this new compilation. Finally, I would once again like to thank the team of the Galway Review, the Cuirt Festival organisers and Anne Mc Cabe Artistic Director of an Taibhdhearc our hosts for this event, for their collaborative and helpful support in progressing Galway as a literary capital in Ireland.